Click here for my previous FCCN posts. * These results were somewhat mixed. True, the £0.8m underlying operating loss was not a great surprise. However, the performance within FCCN’s Retail chain was a little disappointing — especially during H2 — and I do not expect much in the way of sales progress within this division in the near future. Nevertheless, the group’s Wholesale and Licensing divisions made positive strides during the year and support the notion of the FCCN brand retaining some appeal. FCCN’s results presentation claimed the average net cash position during the year was £13m. That healthy bank balance, alongside the fact the business is now almost at break-even, continues to provide support for the long-awaited turnaround. Retail revenue fell 12% to £103m — a combination of closing nine loss-making shops and underlying store sales dropping 3%. H2 looked a tad worse than H1. During H2, revenue dropped 13% (vs 11% for H1) and gross margins came in at 56.9% (vs 57.5% for H1). The H2 gross margin performance in particular was disappointing, given FCCN had been recording notable improvements on this measure during the prior twelve months. Nevertheless, the closure of those nine loss-making shops helped the division’s operating expenses reduce to £70.4m for the year. The £34.2m figure for H2 suggests retail operating expenses might drop even further during the current year. FCCN’s results presentation reveals the average store lease has 4.4 years to run, with “poorer performing stores lower than this average”. That sounds promising, as does FCCN’s claim that a further 3 or 4 under-performing stores are set to close during the current year. Online revenue came to £23.8m, versus £23.5m for last year and £22.2m for the year before. Hardly an ASOS-like performance. FCCN says “trading on the high street remains tough”. Well, I say it depends what you are selling and for how much. Results this Thursday from fellow fashion chain Ted Baker, for example, should make FCCN’s board squirm with embarrassment. I am not expecting any major store sales improvement at FCCN in the near future. Wholesale revenue advanced 5% to £75.2m and profits gained 25% to £14.6m — all welcome news. Gross margins were flat, though, at around 32%, but I am pleased Wholesale operating expenses have continued to fall despite revenue increasing. The uplift followed greater sales of FCCN-branded shoes and furniture by third parties. Time to revise my valuation sums and FCCN’s recovery potential. Old assumption New assumption Achievable? Perhaps the most important estimates are gross margins — I am still relying on some worthwhile improvements. However, FCCN has at times reported such gross margins during the last few years and so I don’t see my assumptions as being outlandish. Overall, I am betting more on future margin improvements and cost savings than I am on revenue gains. The £10.6m profit projection compares to the £11.6m I was projecting back in January. 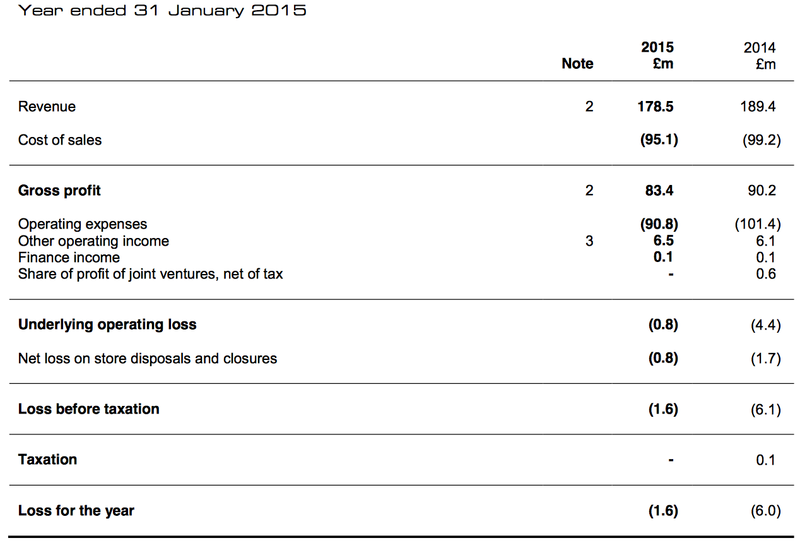 After applying tax at the standard 20%, earnings could be £8.5m or 8.9p per share if my revised guesswork comes good. Then mix in a middling P/E of 12, and I get a prospective market cap of £102m and a share price of 106p. That looks good upside potential to me with the shares at 54p. As before, the potential returns would be quite respectable if this predicted turnaround can be achieved in less than five years. But as today’s results confirm, the journey is unlikely to be entirely smooth. * Next update — probably an AGM statement during mid-May. Chief executive Stephen Marks received a 3% pay rise in 2015 to £308k. A 2% pay rise has been set for 2016. Here’s an extract from my original FCCN write-up. Well, FCCN is still loss-making and the wages still look generous. Naturally I am pleased no bonus was paid in 2015. I just hope the business can soon become profitable and I can stop wondering why the board hasn’t adopted a pay freeze. Mixed news here. Staff numbers have reduced as shops were closed, but total staff pay did not reduce as much. Staff costs as a proportion of revenue advanced to 21.2% for 2015, up from 20.5% in 2014. What’s more, cost per staff member advanced from £17.2k to £17.8k. 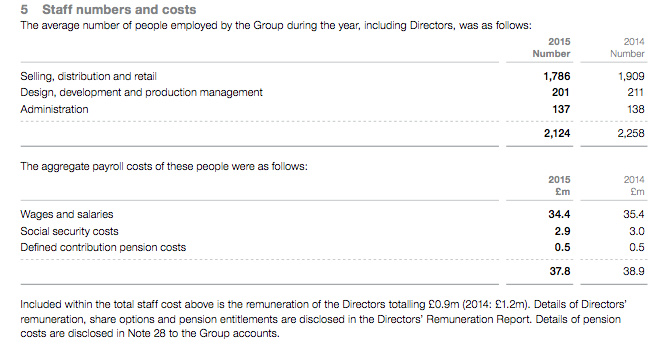 But at least revenue per employee improved from £83.9k to £84.0k. Something I have noticed is that admin staff numbers have been around 130-140 since 2009, when revenues were 20% higher on 2015’s £178.5m at £213.6m. Surely that is a staff expenditure that could be reduced. I am glad to see the annual lease cost fell to £23.9m after a few under-performing shops were closed. I calculate FCCN paid £95.09 per average square foot of store space during 2015, versus £95.72 for 2014 and £96.82 for 2013. Include concession space as well and the £83.63 figure for 2015 compares to £85.06 and £86.67 for 2014 and 2013 respectively. I’d welcome any further decline in the cost per square foot of space. Essentially the lease obligations are now shown as and when they are due (within one year, within two to five years etc). This revised reporting makes much more sense and puts FCCN on the same lease-reporting footing as most other retailers. The total obligation, of £145.0m, has reduced once again — a welcome sight. The total obligation has reduced for the last six years now and was £306.1m at 2009. A significant problem at FCCN has been paying high rents for poor stores and the fact the total lease obligation has been declining is good news on that front. The £145.0m total lease obligation dividend by the £23.9m annual P&L lease cost indicates that FCCN has about 6 years’ worth of lease payments to make. That same calculation showed 8.7 years back in 2009 — further evidence of good progress on leases. True, FCCN is due to receive only £9.4m in the years ahead, but the figure has jumped from the £2.3m reported for 2014. I just wonder if FCCN can increase this £9.4m over time — all income (whether from selling clothes or sub-letting space) is welcome in this particular turnaround situation. I couldn’t find anything else in the 2015 annual report that warranted any comment.